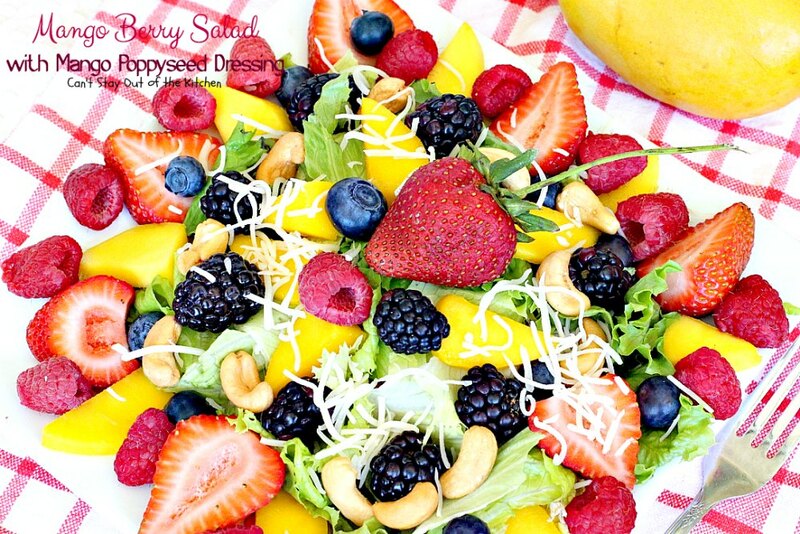 Mango Berry Salad with Mango Poppyseed Dressing is one very special salad. 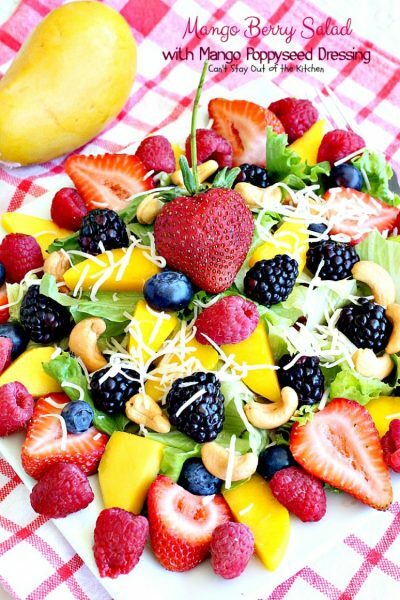 Mangos are matched with all kinds of berries: strawberries, blueberries, blackberries and raspberries. Add some cashews and Swiss cheese and you have a match made in heaven. 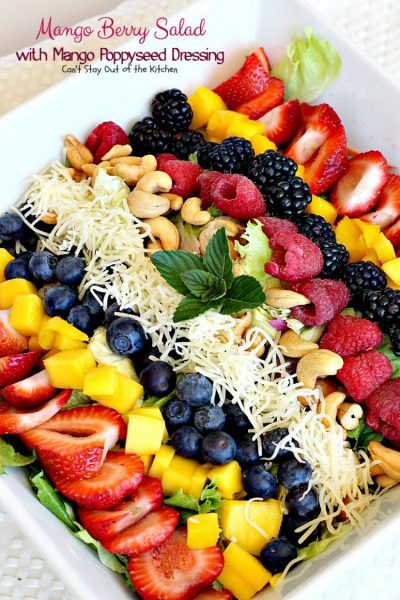 This salad is absolutely heavenly. Plus, the Mango Poppyseed Dressing provides double the mango flavor. If you’re a mango lover like me, this salad will be one you drool over. Plus, this healthy, clean eating, low calorie, gluten free salad and dressing is substantial enough to serve as a main dish salad. If you need meat, adding grilled chicken will do the trick. This salad is not only gorgeous enough to look at but it’s delectable to the taste buds as well. In fact, when my husband first looked at this salad before I served it for dinner, he said, “It looks too beautiful to eat!” It is certainly a festive, colorful salad. Yet it’s filled with all kinds of good fruits that are filled with antioxidants and other healthy benefits. As I stated in yesterday’s posts, I actually forgot about posting this salad. I keep a log with everything I make or remake for my blog. Then I cross it off the list after I post it or update pictures. Well, for some reason, I totally forgot to log this salad recipe. Not sure how that happened except that I must have been making a lot of stuff at the same time and it slipped my mind. In mid-July I wiped out my computer, and no, I didn’t have a backup of everything. Yikes! I was able to get all of my pictures, but I’ve been trying to piece together my eCookbook and all of my individual recipes. Thankfully, many of them are on the blog so I can access them that way! When I was looking through my iPhotos I realized these pictures were there and I had not posted the recipe. I almost deleted them. Thankfully, I realized it before I did so. Anyway, this salad was so good I really didn’t want to lose it. If you’re looking for a lovely salad to serve company, Mango Berry Salad with Mango Poppyseed Dressing is the one to make. Mangos make this salad so wonderful, and if you don’t mind cutting around the pit, it’s absolutely worth it. I use ataulfo mangos but you can use any kind of mango available for this recipe. The salad dressing makes a quart so you can serve it on other salads after this one has been eaten up. Prepare to delight in a wonderful culinary experience after sampling this amazing recipe. Mango Berry Salad with Mango Poppyseed Dressing is incredible. 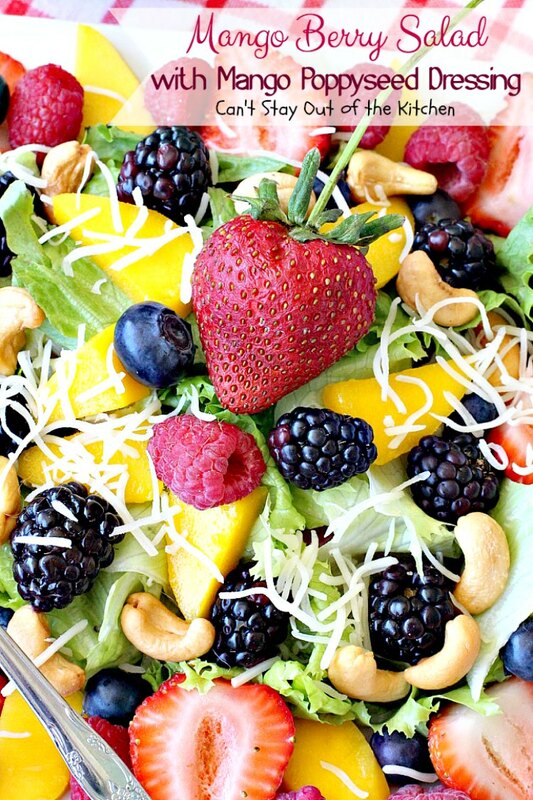 Mangos with four kinds of berries make for one special salad. 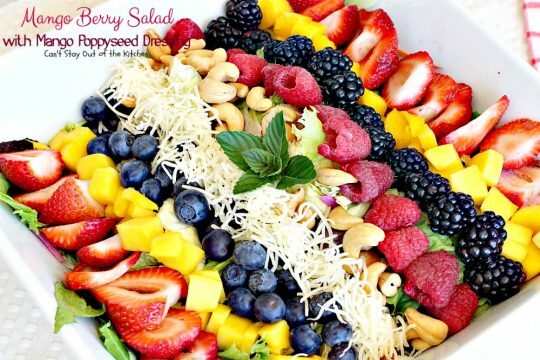 Here I’ve served Mango Berry Salad with Mango Poppyseed Dressing. Layer butter bliss lettuce in a large salad bowl. Add sliced strawberries, diced mangos, blueberries, raspberries, blackberries, cashews and Swiss cheese. Refrigerate until ready to serve. Toss salad and place individual servings on plates. Serve Mango Berry Salad with Mango Poppyseed Dressing. This refreshing salad is great for hot summer days when you don’t want to heat your house up for lunch or dinner. I use Ataulfo mangos but any kind of mangos can be used for this recipe. 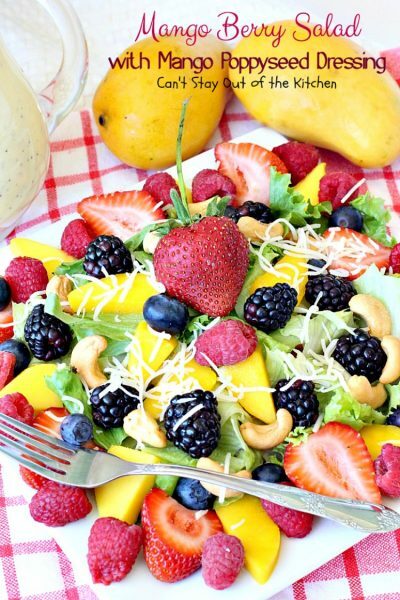 This beautiful salad has double the mango flavor with mango in the salad and in the dressing. It's filled with four kinds of berries, cashews and Swiss cheese. Gluten free. 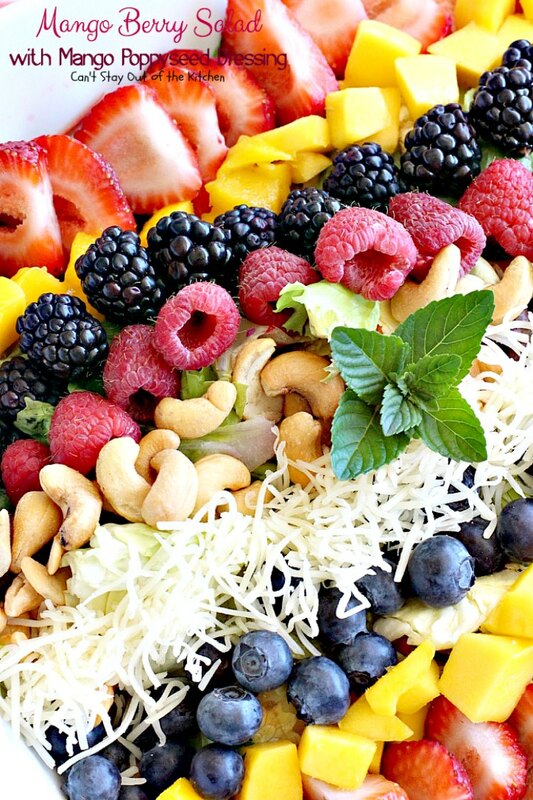 Layer cashews, berries, Swiss cheese and mangos on top. Toss salad gently before serving. 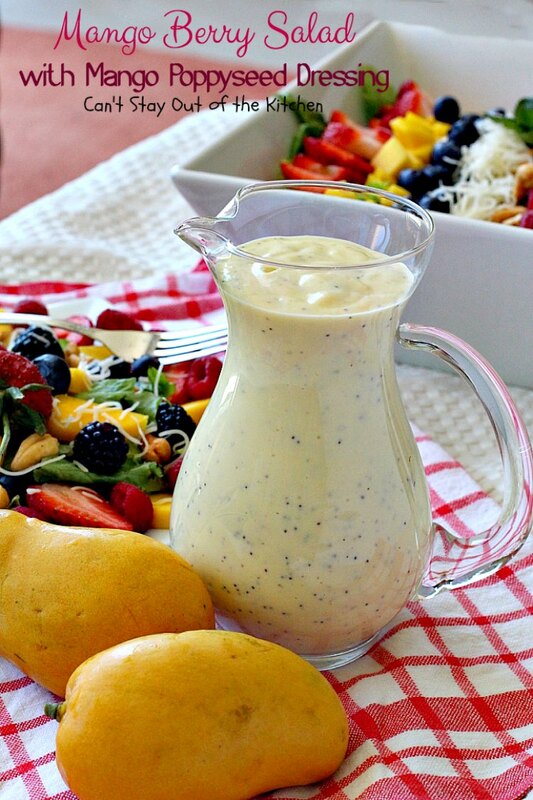 Drizzle individual servings with Mango Poppyseed Dressing before serving. 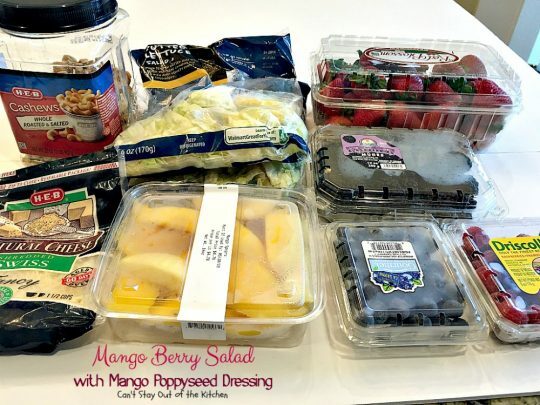 This beautiful salad has double the mango flavor with mango in the salad and in the [url href=”http://cantstayoutofthekitchen.com/2016/08/10/mango-poppyseed-dressing/” target=”_blank”]dressing[/url]. It’s filled with four kinds of berries, cashews and Swiss cheese. Gluten free. This salad is fairly easy to make. You can have it ready in about 15 minutes. 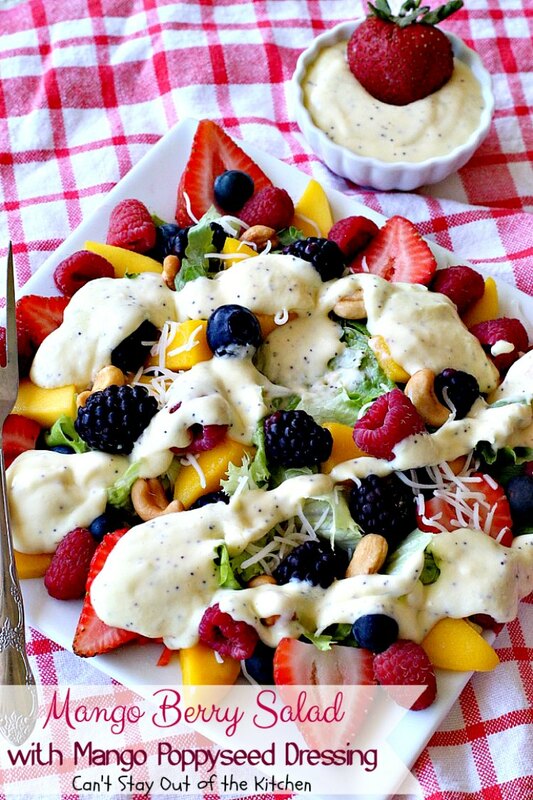 Cashews and Swiss cheese add a really nice crunch to this salad. 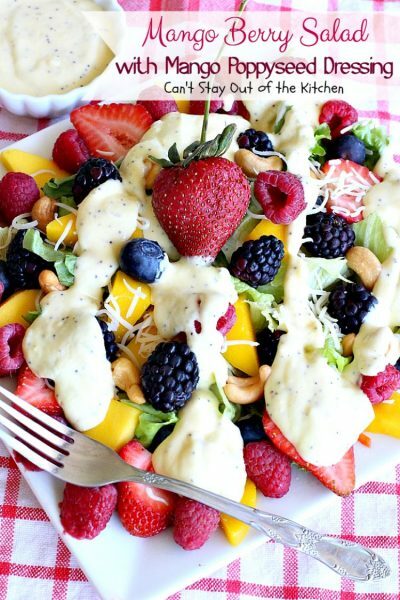 Isn’t Mango Berry Salad with Mango Poppyseed Dressing gorgeous?